Alex George is a writer and a lawyer. He was born in England, but presently lives in the midwest of America. His latest novel, A Good American, was published by Amy Einhorn Books, an imprint of Penguin/Putnam, in February 2012. It was a national and international bestseller, and was a Library Journal Best Book of the Year. His new novel, Setting Free The Kites, will be published by Penguin on February 21, 2017. Alex has been named as one of Britain’s top ten “thirtysomething” novelists by the Times of London, and was also named as the Independent on Sunday’s “face to watch” for fiction in its Fresh Talent feature. Alex read law at Oxford University and worked for eight years as a corporate lawyer in London and Paris. He moved to the United States in 2003, and re-qualified as a US attorney. 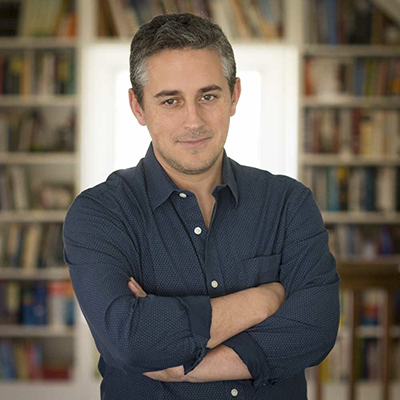 In addition to writing, he also runs his own law firm and is the founder and director of a new literary festival, The Unbound Book Festival. Alex is married to the writer and critic, Alexandra Socarides. They live in Columbia, Missouri with their four children. His hobbies include listening to obscure jazz albums, playing his saxophone, and cooking (and eating) complicated meals. He has appeared on television dancing in a shark suit. Loooong story.